Happy New Year everyone. I hope that you all have been enjoying the nice winter that we have been having. Although I don’t have any mares to foal out this year, I sure would like to see this continue for all of those that do. On January 12, 2019, the SQHA had their AGM in Moose Jaw, SK., where we saw a new Board of Directors and Executive voted in. I would like to thank outgoing directors, Kim McMillan, Kim Leugner, Karrissa Monk and Rachael Schwinghammer and Trevor McBurney – President for your past service to SQHA. 2019 is going to be a year of rebuilding, growth and transparency. We are facing tough financial times, but I believe that we have a great board and that we can work through this hardship to ensure continued support to our membership, youth and equine industry with your support. Our current plans are to continue the Band City Quarter Horse Show (NRHA) and Summer Slide N Celebration Shows. 2019 has seen some changes. We are currently in the process of replacing our Show Secretary and Show Manager, but we are working to ensure that we are able to provide our membership with shows and programs that you have come to depend on. SQHA will be running our Facebook Auction and Buy-a-Pro Auction once again in February. I would like to thank all of the trainers (Ont to Alta and MT) that have donated their services for us to auction off. I will also be looking for auction items to bid on, so if you would like to donate an item please contact myself and I will look after it for you. We have three Facebook pages available for our members to use: SQHA, SQHA– Buy& Sell and SQHA – Facebook Auction, so make sure you join each. 2019 membership forms and sponsorship packages can be found on our website and SQHA Facebook page, so please renew early. In closing, I would like to invite our membership to contact myself with any ideas you have to improve all aspects of our Association, be it breeding, showing, trail riding or cattle events. Our association is the provincial affiliate to the CQHA and AQHA and we are here to represent all Quarter Horses. Calgary, AB - Dr. Wayne Burwash is pleased to announce the launch of the Shannon Burwash Memorial Award for Equine and Agricultural Studies at The Calgary Foundation. Established to honor the legacy of Shannon's love for the horse and her contribution to the horse industry, the award will benefit Canadian post-secondary students in any field of study, with a preference for those pursuing agriculture, agri-business or equine-oriented studies. Shannon's involvement with the horse industry, and more specifically the Quarter Horse industry, was extensive. She was an active director and treasurer for the Quarter Horse Association of Alberta and the Canadian Quarter Horse Association and an Alberta director for the American Quarter Horse Association. Shannon also was very active on Equine Canada committees. 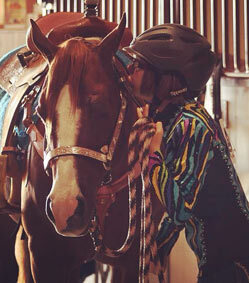 She loved riding and showing horses and promoted good horsemanship, sportsmanship and a love for their pursuits. She passed away suddenly in 2013, after returning from the Sun Circuit in Arizona with Soo Good, the three-year-old gelding she and Wayne raised. "Besides her family, Shannon had two big passions in life," says Wayne. 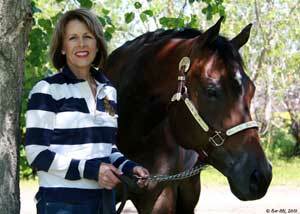 "First, she loved the horse and was devoted to enriching the horse industry. Her second passion was education. She felt strongly that all young people should pursue post-secondary education." Guided by these passions, Wayne knew that a scholarship supporting young people involved with horses and agriculture and pursuing advanced education in those fields was a fitting tribute to Shannon. His commitment to this award is such that he will personally match all other donors' contributions up to $50,000. Annual Scholarships at a minimum of $2000 will be distributed commencing mid-2015. Preference will be given to eligible, full-time, post-secondary students whose studies have emphasis on the horse, agriculture, agri-business or equine veterinary medicine. Eligibility and application details will soon be available at The Calgary Foundation's website at http://www.thecalgaryfoundation.org/grants-awards/student-awards. Online: Visit www.thecalgaryfoundation.org, choose 'Donate Online' at top, right hand side of home page, then choose "Select from Funds to support a current celebration, remembrance or fundraising activity", and then search for 'Shannon Burwash' Fund in the drop down menu. VISA and MasterCard are accepted. By Phone: To pay by credit card over the phone, call 403-802-7700 during office hours 8:00am - 4:00pm. Please do not leave your credit card number on voicemail. In Person: The Calgary Foundation, Suite 700, 999 - 8 Street SW, Calgary during office hours.